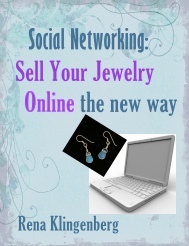 "Learn How Web 2.0 and Social Networking can More Than Triple Traffic to Your Etsy Shop, Your Ebay Store, or Your Jewelry Blog or Website Attract New Customers ... And Build Your Jewelry Business Like Crazy"
"Get on the Announcement List for First Dibs at the Upcoming Seminar Call with Author and Jewelry Business Success Expert Rena Klingenberg"
"I'll be talking with Author and Jewelry Business Success Expert Rena Klingenberg about her newest book, "Social Networking - Sell Your Jewelry Online the New Way. " We'll talk about how you can use social networking, social media to skyrocket your handmade jewelry business. This is really important stuff for anyone online or considering getting up and running online." The Cutting Edge Tips and Strategies You Can Use IMMEDIATELY to Skyrocket Your Handmade Jewelry Business. Secrets Of A Handcrafted Jewelry Shopping Service. I strongly advise anyone interested or involved in selling online to jump on this list. I'll be asking some really action oriented questions so that you'll be able to implement some of her strategies immediately and see results. **I'm also going to finagle some bonuses just for people who listen to the call too, so don't buy the book just yet. You'll get more details on the call. Never listened to audio online before? If you've never listend to an audio interview online, its really easy. There will be an audio player that you can click "play" on, just like a CD player. And you'll have access to an MP3 download too. That way, if you have a slower connection you can download it and listen to it at your leisure. It's early days, and the date and details have not yet been confirmed. I'd really like to gauge interest so that I can deliver the information you want to learn about. Get extra bonuses and freebies we haven't yet worked out. Did someone send you this link? Subscribe to the I'm Making Jewelry in my Jam Jams Newsletter and get more cool links like this in your inbox. Just click here to subscribe for free to my delightful newsletter.